Heart failure, often referred to as cardiac failure or congestive heart failure, occurs when the heart is unable to pump sufficiently to maintain blood flow to meet the body’s needs. A lot of health conditions contribute to heart failure. These include coronary artery disease, myocardial infarction, also known as heart attack, high blood pressure, valvular heart disease, alcoholism, cardiomyopathy, and atrial fibrillation. These heart conditions contribute to heart failure by altering either the anatomy or physiology of the heart. Heart failure is a common, costly, and potentially fatal condition. About 40 million people were affected globally in 2015. In developed countries, around two percent of adults have heart failure, and in those over the age of 65, this increases to six to 10 percent. In the year after diagnosis, the risk of death is about 35 percent, after which it decreases to below 10 percent. Five percent of emergency hospital admissions in the UK are associated with this disease. Heart Failure Prevention & Treatment, as the name implies, discusses this health condition in details. It begins with a detailed explanation of the anatomy and physiology of the cardiovascular system (comprising the heart and the blood vessels) before proceeding to the disease condition. This will enable the listener to have a firm grasp of heart failure. 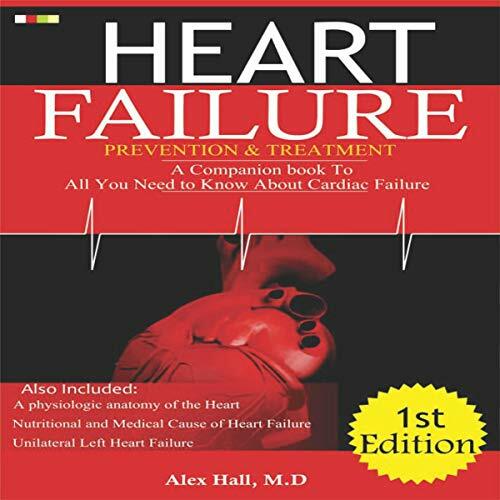 Heart Failure Prevention & Treatment is written in simple English, with detailed explanation of medical terms to allow for easy comprehension by listeners in the nonmedical field. We hope that our listeners will find this audiobook a very useful tool in the war against the menace of cardiac failure.